The high burn cordwood test deserves a little explanation. 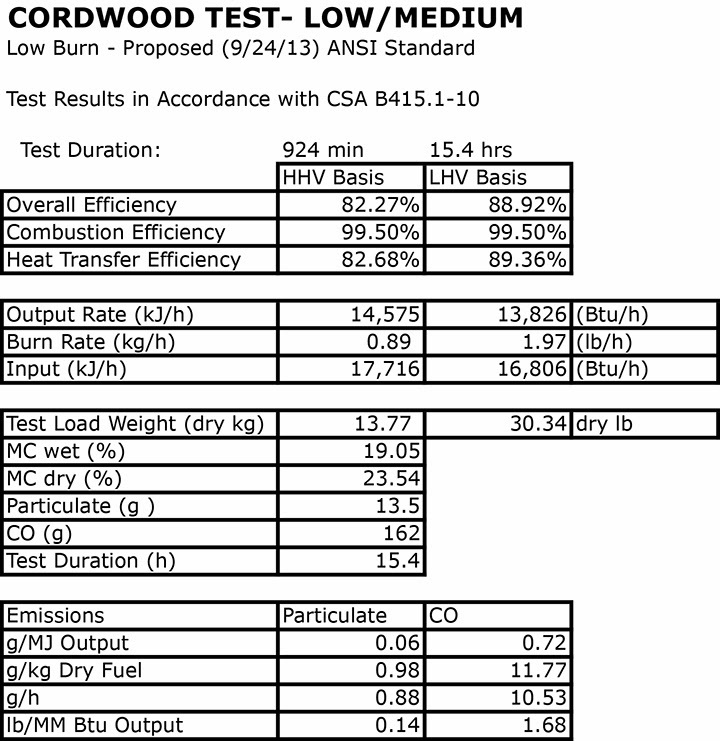 During EPA testing using Douglas Fir cribs, the Output rate was about 60,000 BTU/hr. 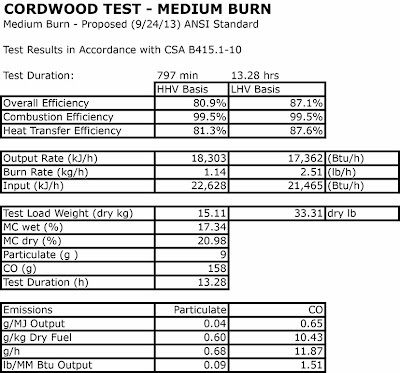 During the cordwood test, the output rate (at the same damper setting) was 24,774 BTU/hr. Why is this? 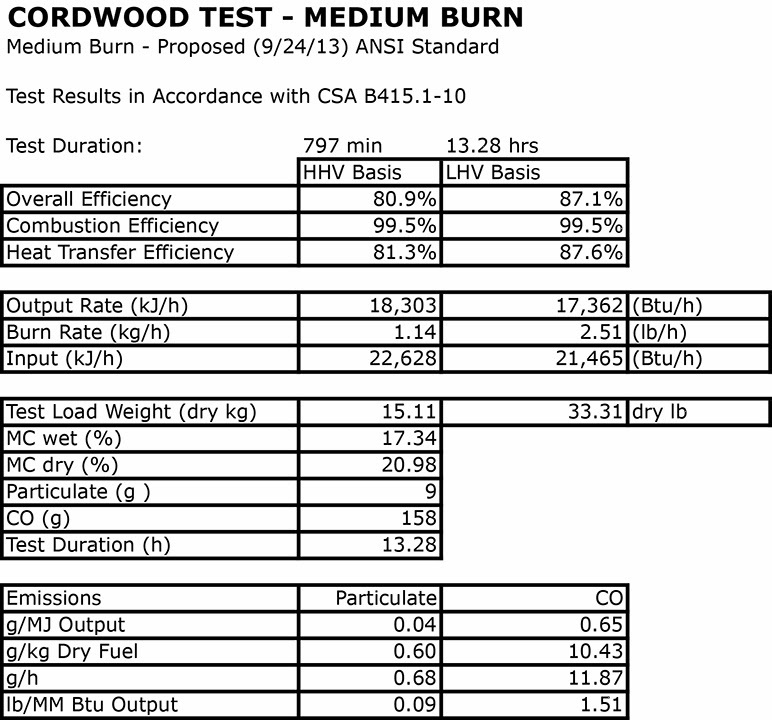 It’s because there is less exposed surface area during the cordwood testing, and as a consequence the fuel load doesn’t burn as fast (and the BTU output rating is essentially just a speed rating: you put a fixed number of BTUs into the stove, and the faster the stove consumes the load the higher the BTU output rating). 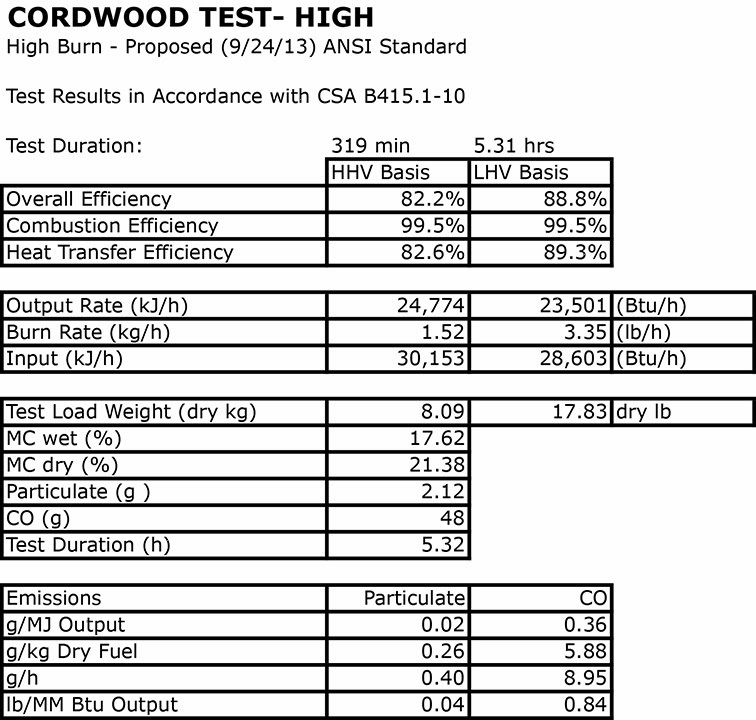 The cordwood high burn lasted 5.3 hours; the EPA crib test had approximately the same load weight, but lasted 2 hours. 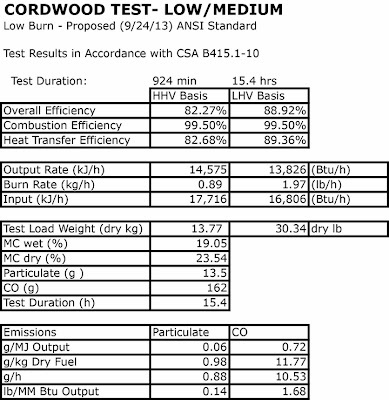 One of the curious things that manufacturers do is they usually state that the high output using cordwood is greater than the high output using EPA cribs, whereas in fact it is almost always lower. Another thing that manufacturers often say is that they cannot provide efficiency results because they require separate tests and cost too much, which again is not true. Efficiency can be calculated for any EPA test (even retroactively) because the test labs have all the data and the spreadsheet is available from the Canadian Standards Association for a nominal sum. 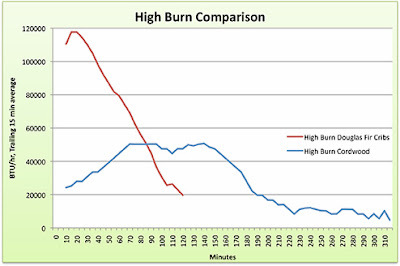 Below is a graph comparing the high cordwood burn with the high burn for the EPA test, using Douglas Fir cribs. Both loads were approximately 20 pounds. If you were a manufacturer, how would you rate the output of this stove?